its beauty matching your own. and the night a sound rest. 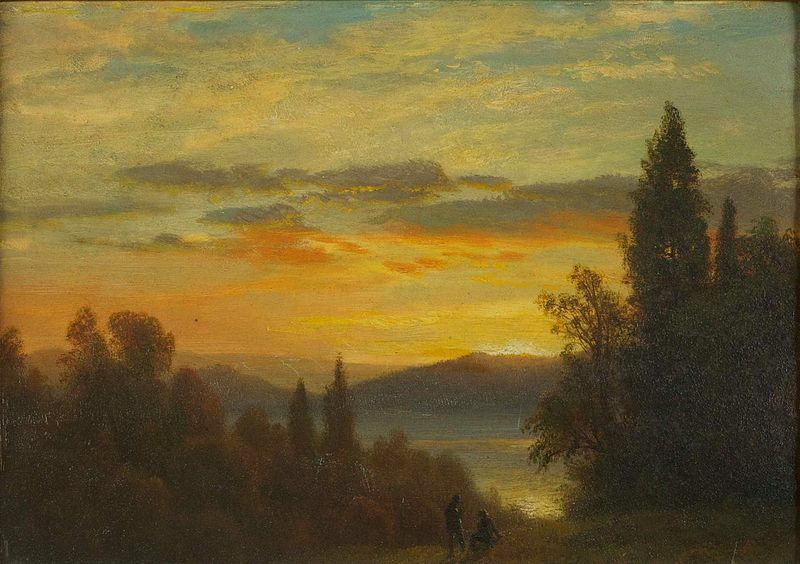 This entry was posted in Uncategorized and tagged Albert Bierstadt, birthday, birthday wish, Hudson River School, poetry. Bookmark the permalink. It was composed for a cousin . . . partly out of embarrassment, because I didn’t remember the birthday until Facebook told me so. My old birthday calendar’s gone missing; I think it’s trying to hunt down its parents to find out if it is Julian or Gregorian. Oops, sorry, I took it to be Happy Birthday to your blog. Faux pas, Apologies. You’re actually close, CP, and the fault is partially mine: the anniversary was at the end of August, but I was preoccupied, and so didn’t note it. And here’s the other Bierstadt, CP, that I mentioned in the comments about chapter 44 of P&P. Again, Ah-ha! I hadn’t looked at the credit, though I did have it taped as German Romantic. Okay, so I’ve just checked him out on Wiki. Change that to American-German Romantic!